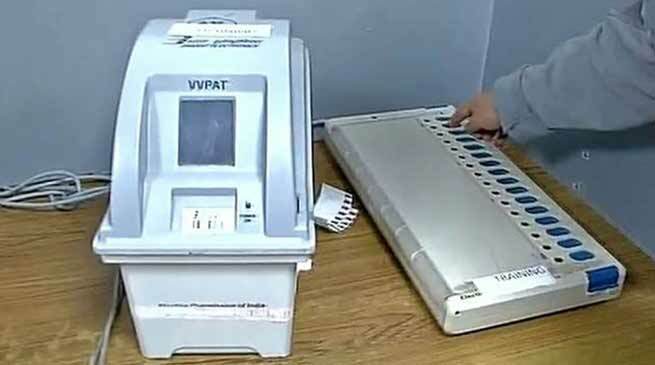 “This move by the administration is to dispel doubts that are being raised about the integrity and authenticity of EVMs and VVPATs”, said an official. With a view to creating awareness on the working of EVMs and VVPATs, the Hailakandi district administration has initiated steps in view of the upcoming Lok Sabha elections. Additional Deputy Commissioner, Election, EL Faihriem has issued an order on Tuesday in which he entrusted several officials with the responsibility of carrying out awareness campaigns on electronic voting machines (EVMs) and how the paper trail verification of votes (VVPATs) works, under the overall supervision of Election Officer, Rahul Doley. Creating awareness on the voting machines will be done at DC’s conference hall, at 519 Dayamoyee Pathsala (PS Nos.186, 187 and 188), Swami Vivekananda MV School (PS Nos.184 and 185) and 213 Haricharan Mahamaya Pathsala (PS Nos.206 and 207) here on Friday. Besides Doley, other officers entrusted with the task are Ashad Ahmed, Assistant Engineer, PHED, Dr. NC Das, ADO, Agriculture department and AR Ahmed, SDAO, Agriculture department. District Development Commissioner, CEO, Zilla Parishad, Additional Deputy Commissioners, SDO(S), Circle Officers and Assistant Commissioners have been asked to be present during demonstration and awareness on EVMs and VVPATs.The Electoral Registration Officer, 6 Hailakandi LAC to involve the BLOs in ensuring maximum turn-out of people during the demonstration of the equipment at the selected polling stations.